Choose the right custom homebuilder in Greensboro to avoid problems. When you start designing a custom home with a custom home builder you should already have a list of the features that you must have in your new home as well as a wish list of features that you’d like to have if they can be worked into the design. Because the home building process does take some time, the sooner you have those lists completed the sooner the process can get started and the faster your home will be done. Spend some time thinking about the features and elements that you want in your custom home so you will be ready to start the design process. Unlike buying an existing home there could be several loans involved in the purchase of a custom home. You could possibly have a mortgage for the finished home, a loan to buy the land that the home will sit on, and a construction loan to pay for the building of the home. Some builders will finance the construction of the home themselves. Be sure that you understand the unique financing of a custom built home before you sign a contract. Choosing the right homebuilder is important to make sure that you get the quality home that you want. 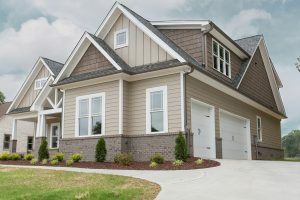 It’s also important because when you apply for financing, the finance company or bank will consider the reputation of the homebuilder as well as your financial information when they are making the decision on whether or not to approve you. Make sure that you thoroughly check out any custom home builders that you are thinking of working with and double check that they have a good reputation in the industry. A common mistake that people make when planning a custom home is planning a home that is out of scale with the piece of land that it sits on. The size of your home should be balanced with the size of the plot of land that it will be built on so that you don’t end up with a very large house on a very small piece of land or vice versa. Talk to your builder and get expert recommendations when it comes to deciding on the size of the house. As a general rule of thumb, you should plan on a custom built home taking about a year to complete from start to finish. It may be done in as little as six months but it’s best to plan on it taking at least a year so that you don’t end up having to crash on a relative’s couch because you sold your previous home and your new home isn’t ready yet. The process of buying a custom built home is radically different than the process of buying an existing home but a real estate agent that specializes in custom-built homes can be a big help to guide you through the process. Consider hiring an agent that has experience in custom built homes to help you navigate the process. The best thing you can do is communicate your must-haves and wishes to your homebuilder and let them design the home accordingly. If you’d like to see some of the amazing designs an experienced custom homebuilder in Greensboro can create for your next home, call R&K Custom Homes today.